I've briefly interviewed Alexandra Moltke Isles a couple of times. This time was while I was doing research for Big Lou, the biography of Louis Edmonds, in 1996. 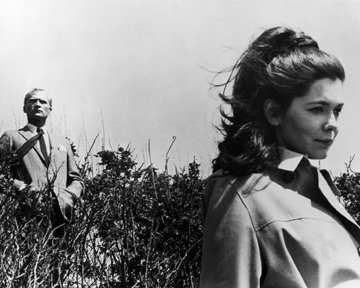 Alexandra worked with Louis on Dark Shadows in the 1960s. She played the eternally perplexed governess, Victoria Winters. Craig Hamrick: What was it like working with Louis? Alexandra Moltke Isles: The thing that impressed me about him was the way he could be lots of fun, and then suddenly switch to being a total professional. He would be saying something incredibly droll -- or naughty -- one minute, and then a cue would be given and he would slip into character, leaving Nancy (Barrett) and I very much out of character and trying not to laugh at whatever witticism he had just uttered. Roger Collins had zero sense of humor, so it was doubly hard to listen to him pontificating, knowing that Louis' devilish wit was simmering just beneath the surface. CH: What kind of actor was he? AI: Louis was really a character actor, and I always admire the grace with which he could slip into his role and be consistent despite the inconsistencies that resulted from having three script writers. He was also very steady during the terrors of taping. He could read the Teleprompter beautifully, and I felt that if the set fell down or everyone forgot their lines, Louis would somehow save the day. CH: Did you keep in contact with Louis after you left Dark Shadows? AI: My closest friends in the show were Nancy, Joan, Louis and Grayson Hall, and I kept up with them after I left the series. I think I saw Louis mostly at Joan's house. She adored him. They had a similar combination of irreverence and professionalism that made them so wonderful to work with. They also had style. CH: I know Louis called Nancy Barrett "Naughty Nancy." Did he have a special name for you too? AI: If he had a nickname for me, I've blocked it out! CH: Do you have any behind-the-scenes type pictures of you and Louis from your days on DS? AI: I wish I had pictures for you. I do remember that Louis was almost as uncomfortable as I was standing on that cliff in Newport, with Dan Curtis, hundreds of feet below on the beach, yelling up to us, "Now move around." I was closer to the edge, and it was a great comfort that Louis had the good sense not to budge an inch. CH: Is there anything else you recall about Louis? AI: Louis had miniature Italian Greyhounds and one of them got heart worms. When I give my dog his monthly heart worm pill, I always think of how much Louis loved those dogs. CH: OK, well, thanks for your time! AI: Please give Louis my love. And best of luck with the book. 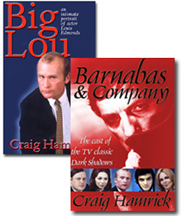 For more stories about the Dark Shadows cast, read Barnabas & Company, a new book by Craig Hamrick.